Penrhyn Stanlaws was born Earnest Stanley Adamson in Dundee, Scotland, on March 19, 1877, according to his naturalization applications at Ancestry.com, which also has a family tree. Stanlaws was the fifth of seven children born to James (1842–1891) and Jessie (1844– ). 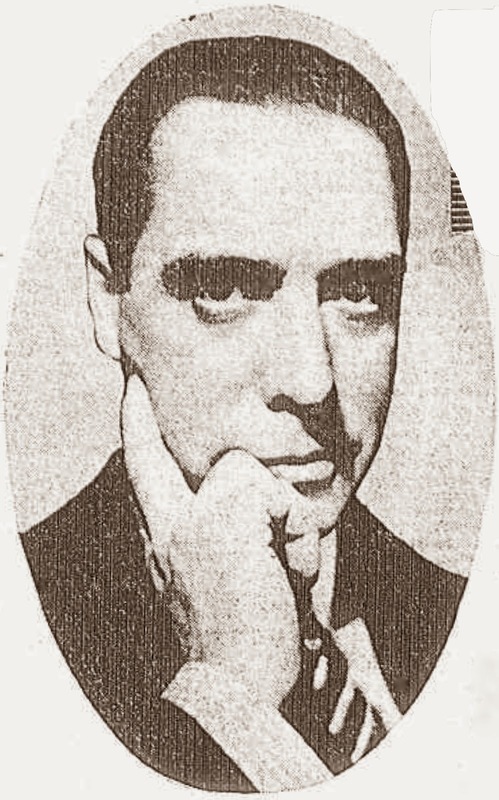 The caption to a photograph of Stanlaws, published in the New York Sun, September 2, 1917, said his full name was Arthur Earnest Penrhyn Stanley Adamson. …Some time after he had come to the United States his elder brother, who had won some fame for the family name in London, suggested that, as both used the same initials “S. A,” in signing their pictures, the younger might do well to change his name. The older brother was Sydney Blair W. Adamson (1872– ). The Times said Stanlaws’s parents were amateur painters. Information regarding Stanlaws’s childhood education and art training has not been found. An office boy named Stanley Adamson was working in the business end. We brought him up to the art department. Later, under the name of Penryn [sic] Stanlaws, he became widely known as a portrait painter and magazine-cover artist of exceptional delicacy and refinement. In London, Stanlaws was known as “Penryn Stanley”. To-Day, February 23, 1895, published “An Unlawful Interference” with his illustrations. 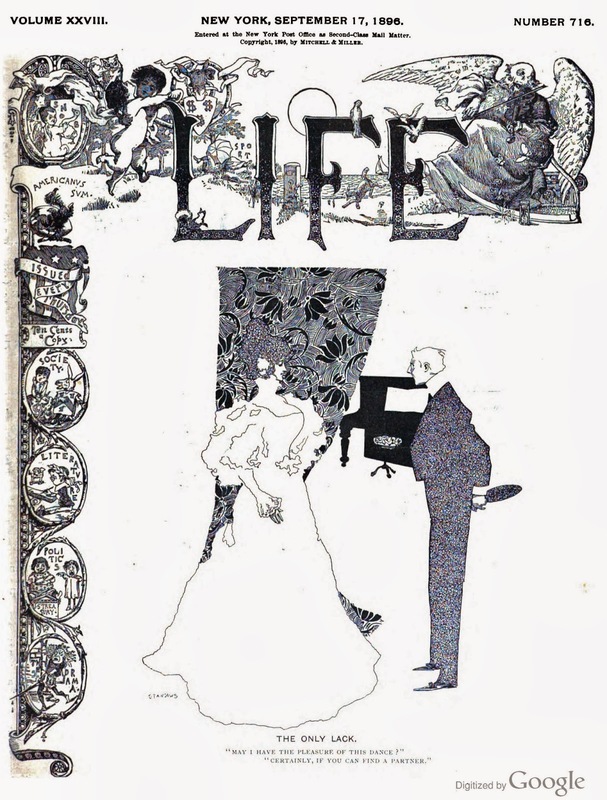 Stanlaws also contributed artwork to The Idler, in 1895, on these features: Realism!, The Idler’s Club here, here and here, and The Play of the Month. His brother, Sydney, was also a contributor. Stanlaws was named as a contributor to the first issue of The Minister. 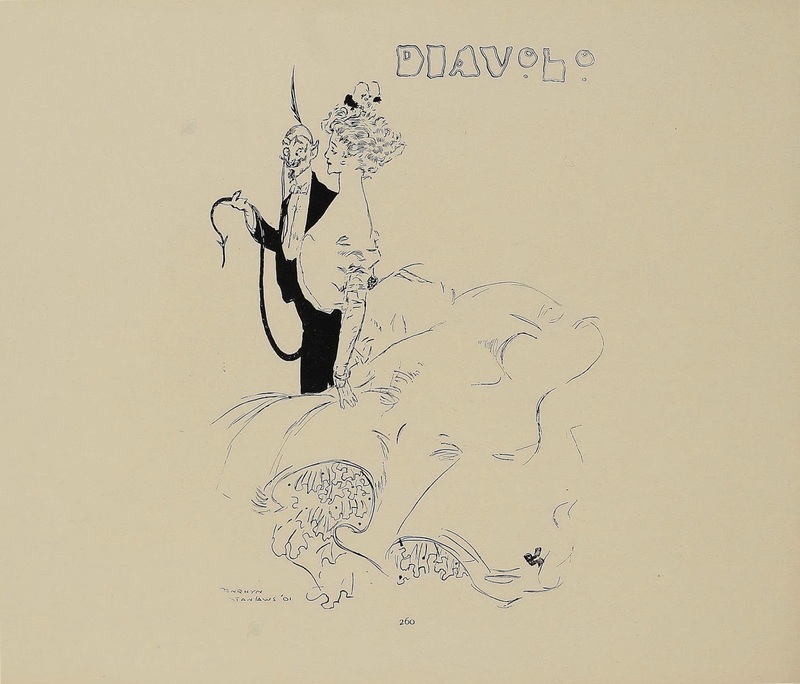 In 1896 Stanlaws returned to the United States and sold drawings to Life. …[Stanlaws] tried to get a start at Chicago, meeting with but little success. Stanlaws went back to Scotland, where he became acquainted with David Whitelaw, a celebrated decorator. They formed a partnership and Stanlaws, with Whitelaw, returned to America and met with the most gratifying success. Stanlaws made the figures in the drawing and his partner the decorations, the pair producing a high class of work. Whitelaw finally returned to Scotland, but Stanlaws remained, working for the different periodicals. His productions appear from time to time in Judge, Life, Scribner’s and other leading publications. …There is, for instance, the Stanlaws girl. Although drawn by two young artists who are both English, she is yet intrinsically American. She developed gradually, and not until some six months ago did she appear in her greatest efflorescence. Inasmuch, moreover, as one of the members of the curious collaboration that achieved the Stanlaws girl is no longer active on this side of the water, this girl deserves special mention. She appeared, for a time, in our periodicals, charming us with her wonderful hats, her arabesques cloaks, her gowns as wide-skirted as the horizon itself, and then—she passed from our ken. She was something of a pretty vagary…. The Times, April 3, 1898, said Stanlaws was in the April issue of Scribner’s. The Evening Journal, (Jersey City, New Jersey), April 30, 1898, said the May issue of Demorest’s Magazine included Harriet Monroe’s series French Women, “…which has been so charmingly and intelligently illustrated by Penrhyn Stanlaws…”. The “Stanlaws Face” was reported in many newspapers including the Kansas City Journal (Missouri), January 29, 1899. In the first half of 1899 for the Philadelphia Inquirer, Stanlaws produced at least five full-page drawings for its color section. A January 7 house advertisement for the Sunday Inquirer said: “Fair Phyllis’ Part and Mine. A beautiful full page of brilliant color by that well known artist, Penrhyn Stanlaws.” Two drawings were published in February on the fifth and twelfth. The April 2 edition published Stanlaws’s “The Easter Morning Promenade.” The fifth drawing featuring women in outdoor and sporting attire appeared June 4. Stanlaws’s illustrations were published in Harper’s Magazine, March 1899; The Illustrated American Magazine, March 1899; The Book Buyer, May and September 1899; Demorest’s Magazine, July 1899; and Leslie’s Weekly, August 5, 1899. The Princeton Tiger’s New Editor. James F. Adamson (Penrhyn Stanlaws) was elected advisory editor of The Princeton Tiger to-day. Mr. Adamson is taking a two years course in English in the university. He refused a position on the staff of The Saturday Evening Post of Philadelphia to enter Princeton. The Times explained how Stanlaws was able to afford the tuition at Princeton. ...Going back to the other side he was for a time assistant art editor of To-day and The Idler. After a short time he came back to New York and did a series of “Soldier Girls” for Judge, which brought him considerable notice and led to so much work that he was able to send himself to Princeton. In Roses and Buckshot (1946), James Montgomery Flagg revealed who was behind Stanlaws’s assignments. Grant Hamilton was the big shot on Judge. Although little John Schleicher was the editor, Hamilton really was the brains of the magazine. He was a big-bodied, big-hearted man, beloved by all the artists. He was, moreover, the kind of man whose face proclaims that he could not do an ignoble act…. When Grant Hamilton knew that Penrhyn Stanlaws wanted to go through Princeton he arranged to give him enough steady work to support him during his college years. As a result the dainty Stanlaws Girl became a part of the American scene. While at Princeton, Stanlaws produced work for other periodicals. 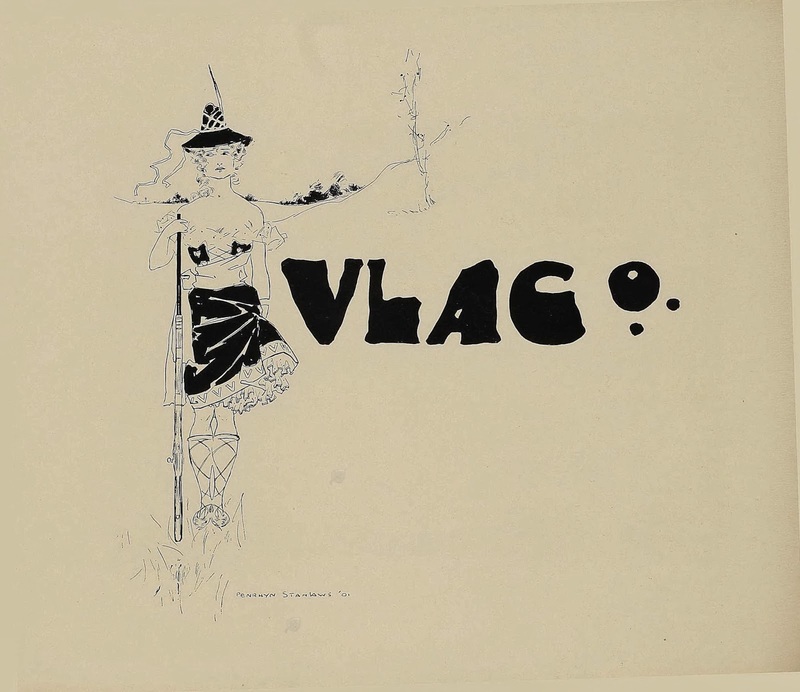 There were three illustrations in the May 1900, St. Nicholas, and one in August 1900. 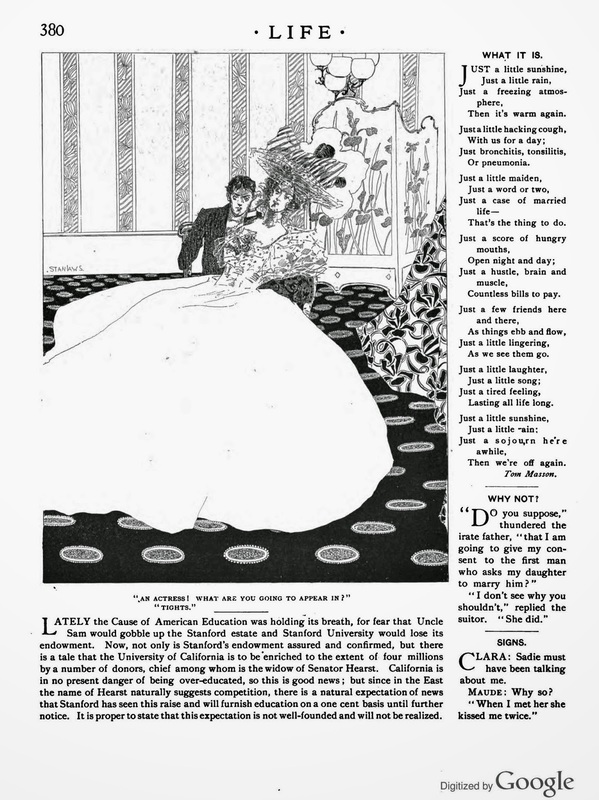 The March 16, 1901 issue of Leslie’s Weekly published a Stanlaws drawing on page 254. On the preceding spread was a full-page illustration, spot illustration and report, “The Strange Story of Aram Keram Deram Minassian”, by Stanlaws’s older brother, Sydney Adamson, who was a war correspondent. Stanlaws was in the April 6, 1901, Leslie’s Weekly. 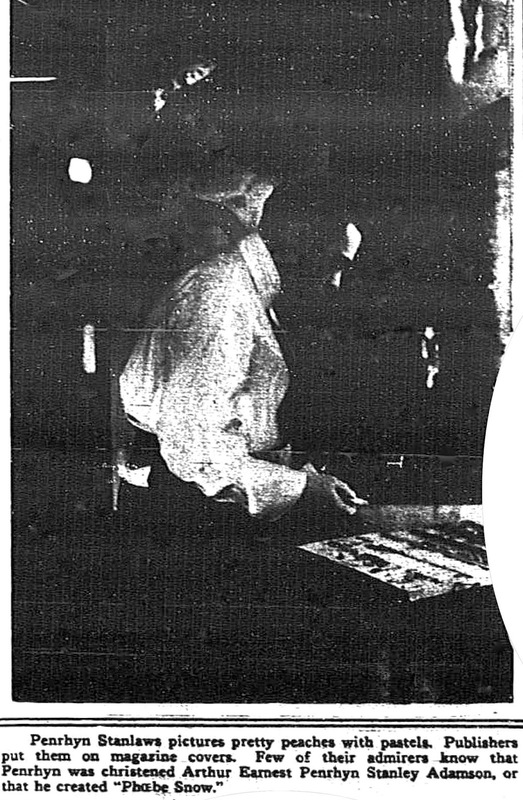 The Boston Herald published Stanlaws’s “Three Studies of the American Girl” February 17, 1901. 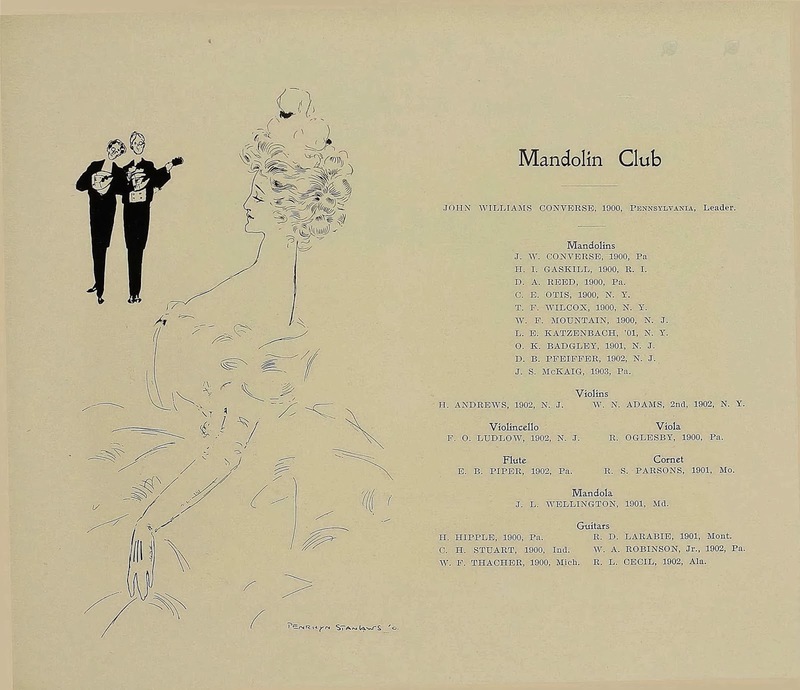 P. Stanley Adamson, the artist whose work over the signature of Penrhyn Stanlaws has attracted attention in the past year, and who has been attending Princeton University, has been elected a member of the Monday Night Club. Mr. Adamson is an Englishman who came to this country a few years ago and who has become a prominent illustrator. The St. Paul Globe (Minnesota), September 16, 1900, reported Stanlaws’s stunt of eating without utensils in Philadelphia. An Effort to Placate the Critic of Its Former Alleged Low Tone. The Sun has told how a writer in the Daily Princetonian of Princeton University declared that the January number of the Princeton Tiger was low in tone and how the editors of the Tiger used this criticism as an advertisement and by means of it sold double the usual edition. Not content with this the Tiger editors decided to turn out at least one number which might satisfy their critic. The result of their efforts appeared last week. 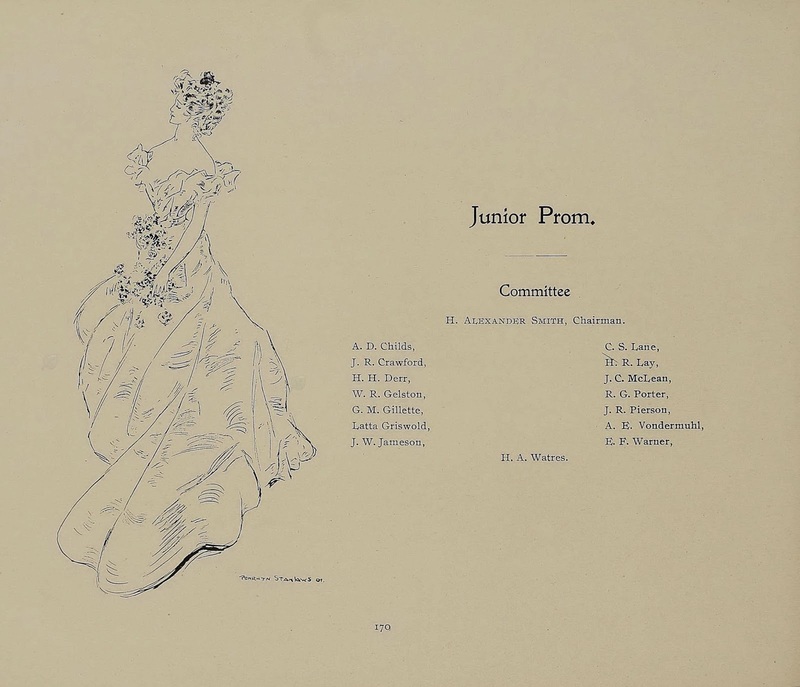 Stanlaws provided five illustrations for the Princeton yearbook, Bric-a-Brac, 1900. The 1901 Bric-a-Brac had two listings for Stanlaws: a Princeton Tiger editor (1899–1900, 1900–1901) and the class roll. 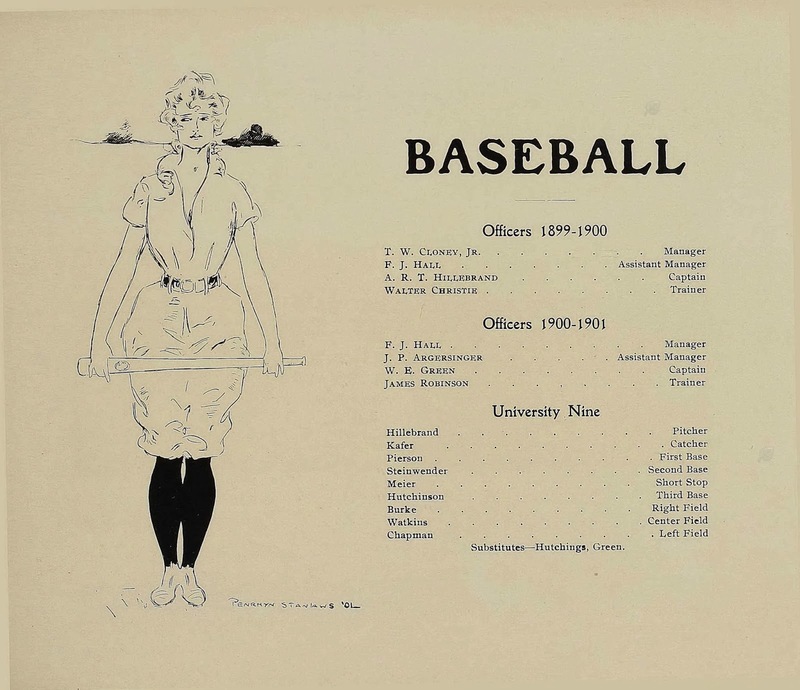 Also, Stanlaws’s College Girls (1901) was published by the Princeton Tiger. …before he had finished the college course, he came to the decision that he would go to Paris and take up the study of the French drama. Once in a Parisian atmosphere he developed more interest in painting than in the theatre with the result that he enrolled at Julien’s and remained in Paris four years. His first picture to be exhibited at the Salon was a portrait of his wife, and this, was followed by other invitations to exhibit there. Around 1903 Stanlaws moved to London. The London Magazine, February 1903, published “The American Girl” which showcased the work of several artists including Stanlaws. There is one English artist who has also succeeded in delineating a type of the American girl, and that is Mr. Penrhyn Stanlaws, whose work is as familiar on this side of the Atlantic as it is on the other. Yet, though typified as American, the Stanlaws girl” is in fact, really British in character and style. Penrhyn Stanlaws, the Artist Enters New Field of Work. London, March 28.—Although Penryhn Stanlaws, the American depictor of pretty girls, is not known as well in this country as he is in the United States, interest has been aroused here by the announcement that a one-act play from his pen has been accepted by Sir Henry Irving. Stanlaws has been here several months. Stanlaws has been encouraged by his first stroke of luck in his new field to go ahead therein, and he has two other plays on the stocks. He says he always has cherished an ambition to be a dramatist, and confessed he would rather be a successful playwright that a successful artist. “But I should like to be both,” he adds naively. By far the most interesting part of Maugham’s Paris experience were the evenings he spent at a restaurant in the rue d’Odessa called the ‘Chat Blanc’. Situated near the Gare Montparnasse, this cheap and nourishing cafe had a ground floor for regular trade, but an upstairs room reserved for a varied group of artists, companions, models, and lovers…. page 194: Flanagan was there again: he was an American, a short, snub-nosed youth with a jolly face and a laughing mouth. page 213: Sometimes they went to the Bal Bullier. On these occasions Flanagan accompanied them. His excitability and his roisterous enthusiasm made them laugh. He was an excellent dancer, and before they had been ten minutes in the room he was prancing round with some little shop-girl whose acquaintance he had just made. page 250: Flanagan, though he was the most scatter-brained person in the world, had a tenderness of heart which was unexpected and charming. Whenever anyone was ill he installed himself as sick-nurse. His gaiety was better than any medicine. The New York Dramatic Mirror, January 29, 1921, covered the reunion of Stanlaws and Maugham at a Hollywood studio lot. Stanlaws, the ‘creator’ of the ‘Stanlaws girl’ was there, a terrible American, and also a girl I had previously seen at Kelly’s. The girl and Stanlaws and the man who was the girl’s host threw bread at each other, and sang American songs very loudly. It was terrible at times…. 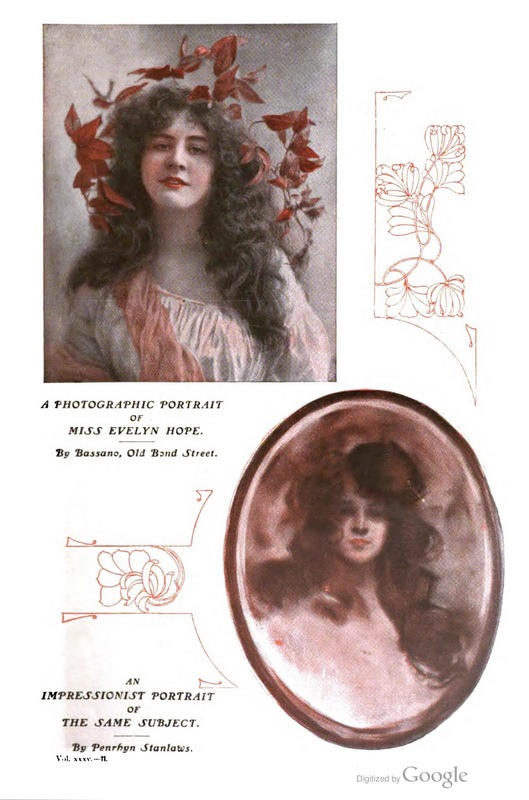 The Strand Magazine, April 1904, published “Artists’ Types of Beauty” which selected paintings and illustrations of women from the past 400 years. The “Stanlaws Girl” was included. 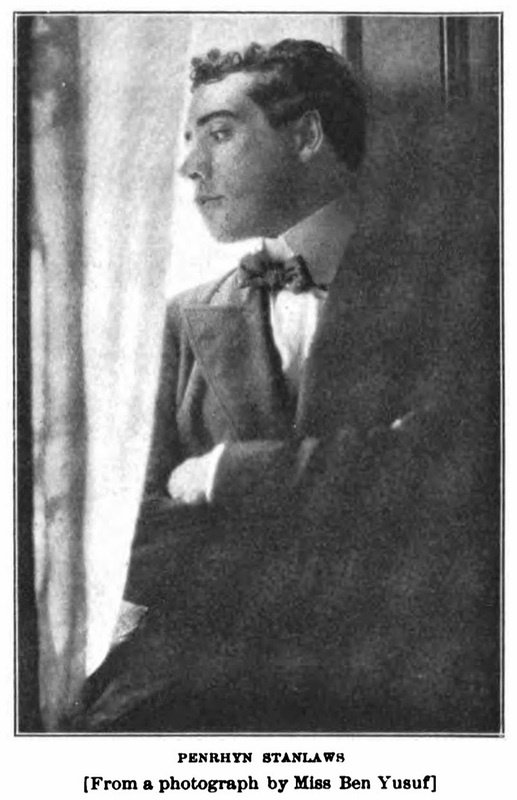 A portrait by Stanlaws, below, appeared in the January 1908 Strand. According to American Newspaper Comics (2012), Stanlaws produced the Sunday strip, The Pretenders, which ran in September 1906. It was syndicated by the American-Journal-Examiner. On December 7, 1907, Stanlaws was aboard the S.S. St. Paul which departed from Southampton, England. 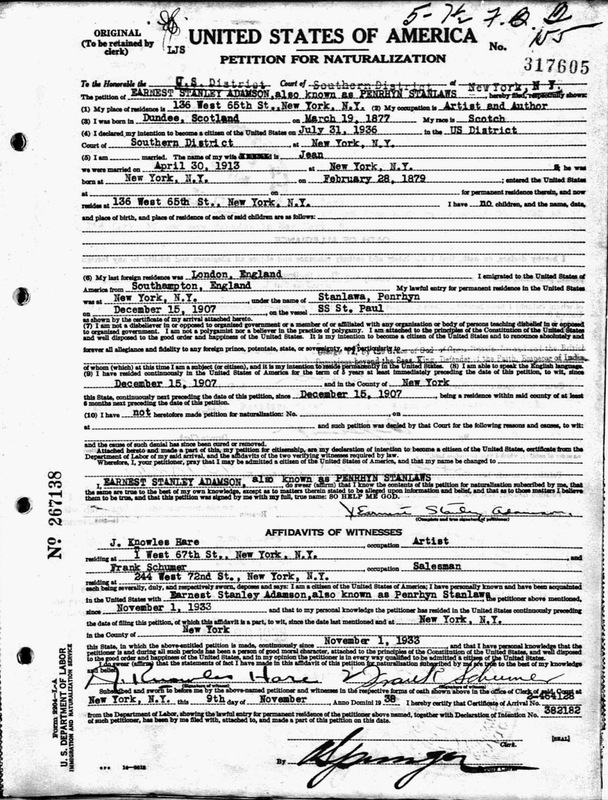 He arrived in New York City on the 15th according to a passenger list at Ancestry.com. 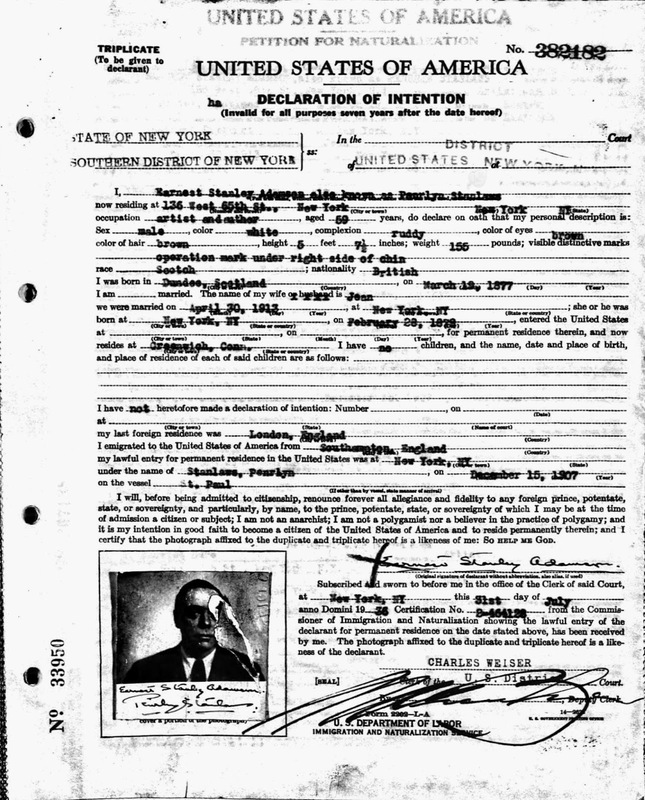 The same date and ship were on his naturalization documents. 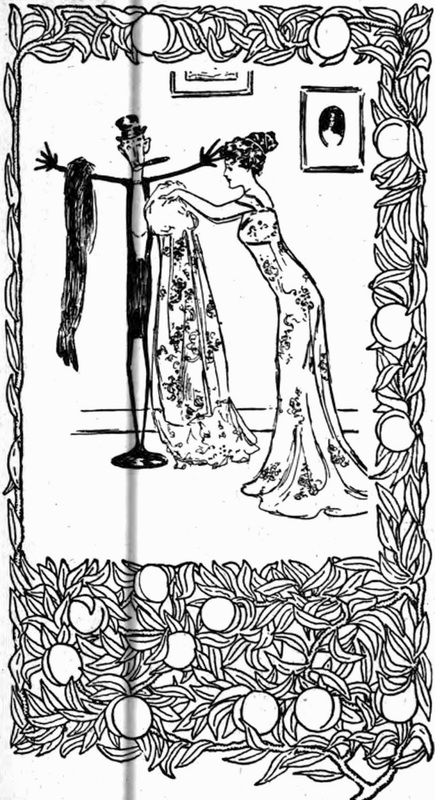 A number of Stanlaws’s drawings continued to appear in London periodicals including the Windsor Magazine in 1908; the stories “Mis’lavinia” had four illustrations, and “Violet’s Flat” had three. American Newspaper Comics said Stanlaws’s second Sunday newspaper series was Oh, Winnie!, which debuted September 27, 1908 and ended March 28, 1909. In addition to drawing and painting models, Stanlaws witnessed his colleague’s marriage to a model. The Fort Worth Star-Telegram, (Texas), May 7, 1909, ran the Associated Press story on Corey Kilvert’s secret wedding. Corey Kilvert,the well known artist, and Miss Elsie Dora Bernard, known among New York studios as one of the prettiest of professional models, were married last night at Larchmont. The wedding was secret, the only one knowing about it until the ceremony was performed, being Penrhyn Stanlaws, the illustrator and portrait painter who accompanied the couple to Larchmont…. Later in 1909, Stanlaws and a few other artists were chosen to illustrate the Armour & Company calendar. 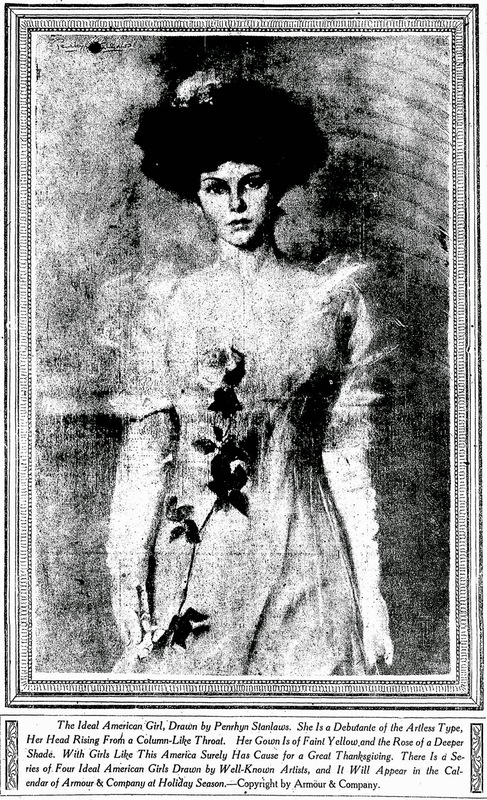 The painting, below, ran in the Denver Post, November 21, 1909. Books with illustrations by Stanlaws include The Custodian (1904), Hilda of the Hippodrome (1910), How to Draw: A Practical Book of Instruction in the Art of Illustration (1904; page 58), The Misdemeanors of Nancy (1902), 1902 Olio (Amherst College), The Opinion Shop (1913), Pippins and Peaches (1909), Caricature, Eleventh Edition (1910) here, here and here, and Caricature, 14th Edition (1911) with five illustrations.